1) What inspired you to write Yesterday’s Echo? Did you draw any part of if from your own life? I’ve read crime fiction all my life so when I think about telling a story it comes out through examining circumstances and characters surrounding a crime. Yesterday’s Echo deals with loss, guilt, and an attempt at redemption. I think all writers draw from life experience when they write. If not from specific events, from emotions felt during dramatic events in their lives. I did specifically draw from my years working in the restaurant business in creating Rick Cahill as he is a restaurant manager. 2) Yesterday’s Echo has a really strong hook. Did you think that up first or summarize it once the writing was done? Thanks for the kind words. It took me a couple of drafts to come up with the hook that ended up in the book. I knew I wanted someone with a dark past to be the protagonist. However, it wasn’t until I came up with what would become the first sentence of the book that I found a way into Rick’s back story. The sentence “The first time I saw her, she made me remember and she made me forget” forced me to find out what was the awful event in Rick’s life that he wanted to forget and what good he desperately need to remember. 3) What local resources do you use in San Diego (Workshops, organizations, classes, editors,groups..) Has the local SD community been supportive? I took classes at UCSD extension taught by Carolyn Wheat ten or eleven years ago when I first started writing Yesterday’s Echo. I’ve been in writers groups ever since. The group I’ve been in for the last three years is led by Carolyn and has a slate of terrific writers. 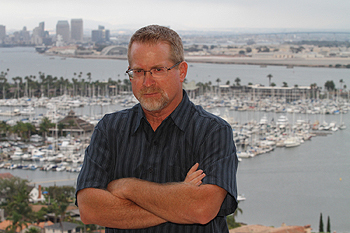 The San Diego writing, reading, and book selling communities have been wonderfully supportive. Mysterious Galaxy, Warwick’s, and Bay Books have been gracious in hosting events and have done a fantastic job of selling Yesterday’s Echo. 4) What advice do you have for beginning writers? Write! I wasted too many years thinking and talking about writing instead of actually doing it. There is no substitute for putting your rear end in the seat and writing. And once you start writing, step out of your cocoon. Don’t write in a vacuum. You need extra sets of eyes to see the things you can’t see in your own work. Join a group or find someone outside your family who can give you an honest critique. 5) What are your thoughts on traditional publishing vs. self publishing? For me, it was important to be published traditionally first. I’m trying to build a career and I think a book published through a house shows potential readers that your book has gone through multiple layers of the vetting process. It also gives you an opportunity to get a variety of reviews which helps build readership. After you’ve built a readership, you have the option of self publishing with a greater chance of success. However, that’s just me and I know there are authors who self published their first book and have had tremendous success. 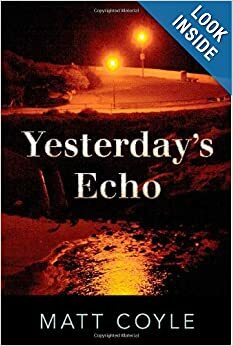 6) How can we order Yesterday’s Echo? In addition, you can buy it locally at Mysterious Galaxy, Warwick’s, and Bay Books.